Mass-market activity trackers — which are usually worn around your wrist, and bear the stamp of brands like Fitbit, Basis, and Mio — have surged in popularity in recent years. According to a 2014 survey-based report by accounting firm PwC, 21% of U.S. consumers own one of these devices, and 10% wear it every day. It’s safe to assume that in the past three years, these numbers have only increased. Earlier this year here at Diabetes Flashpoints, we looked at a study on the effects of wearing a pedometer (step counter) in people with Type 2 diabetes. That study found small but measurable benefits from wearing such a device, including more physical activity and a slightly lower HbA1c level. But another feature that many wearable fitness devices offer — heart rate monitoring — has recently come under some scrutiny. In a study published last week in the journal Annals of Internal Medicine, researchers looked into the accuracy of the heart rate monitoring on four popular activity trackers. As noted in a HealthDay article on the study, they did this by comparing the readings of the wearable devices with those on an actual electrocardiograph (EKG) while participants exercised on a treadmill, as well as when they were resting. When participants were at rest, the accuracy of the wearable devices varied somewhat, but not enough to cause much alarm. But when participants exercised on the treadmill at 65% of their maximum heart rate (defined as 220 beats per minute minus the participant’s age), the devices were substantially less accurate. One device overestimated participants’ heart rate by as much as 39 beats per minute, while another underestimated it by as much as 41 beats per minute. This is particularly worrying because most people presumably care more about their heart rate while they’re exercising rather than at rest, and they may make exercise decisions based on their device’s readings. It’s important to note, though, that the devices weren’t consistently inaccurate — meaning that most of the time, their readings were different from those of the EKG by less than 39 beats per minute. Given that no critical medical decisions will be made using wearable fitness devices, it’s certainly possible that most people wouldn’t mind the level of inaccuracy associated with their readings. 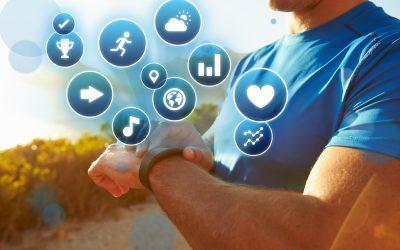 What’s your take on activity trackers — do you use one? Have you tried using its heart rate monitor, if it has one? Have you found this feature to be useful while you exercise, or even when you’re at rest? Does the possibility of inaccurate readings bother you? Leave a comment below!